Summer time is undoubtedly wedding season, but the more of our friends and family members that get married, the more we know couples who decide to wait a little later into the year and have their ceremonies and parties in the fall and winter, during the “off season”. 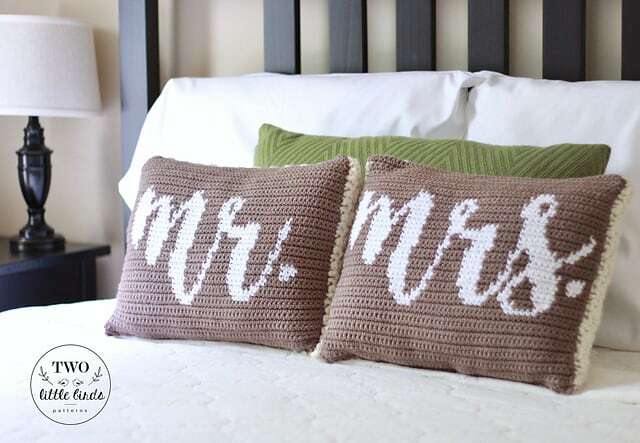 Now, no matter the time of year, we’ve always loved making our own wedding gifts for our loved ones, but the popularity of fall and winter weddings makes it particularly easy for us to do so because we’re such yarn craft enthusiasts! 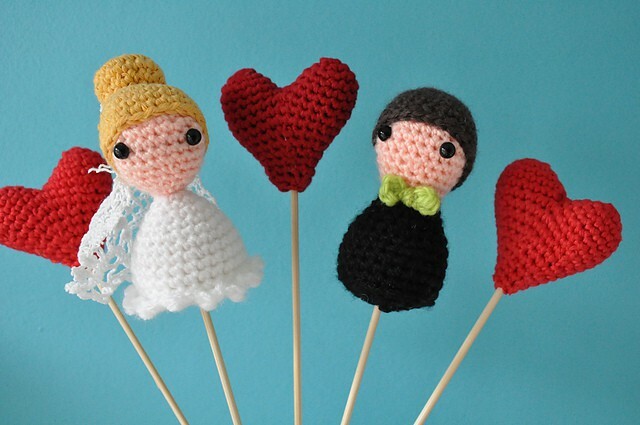 Possibly our favourite way to make gifts for others is to crochet them, and crocheted things make perfect gifts for couples getting married in chilly weather, and also just for people who like receiving things they’ll actually use. 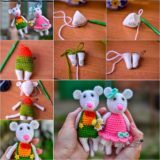 Just in case you’d also like to start crocheting your friends and family wedding gifts but you’re in need to a little bit of inspiration when it comes to ideas, here are 15 awesome crochet projects and patterns that will make anyone on the receiving end happy! Are you somewhat on the beginner’s side of the crochet skills spectrum but you’re still intent on making your own yarn gift for the next wedding you have to go to? 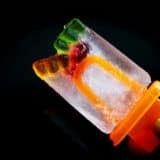 In that case, try making something simple and small but that the couple will actually get some use out of! 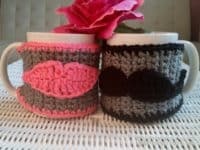 We suggest trying your hand at making these adorable “His and Hers” coffee mug warmers featured on Made With Love by Glama. 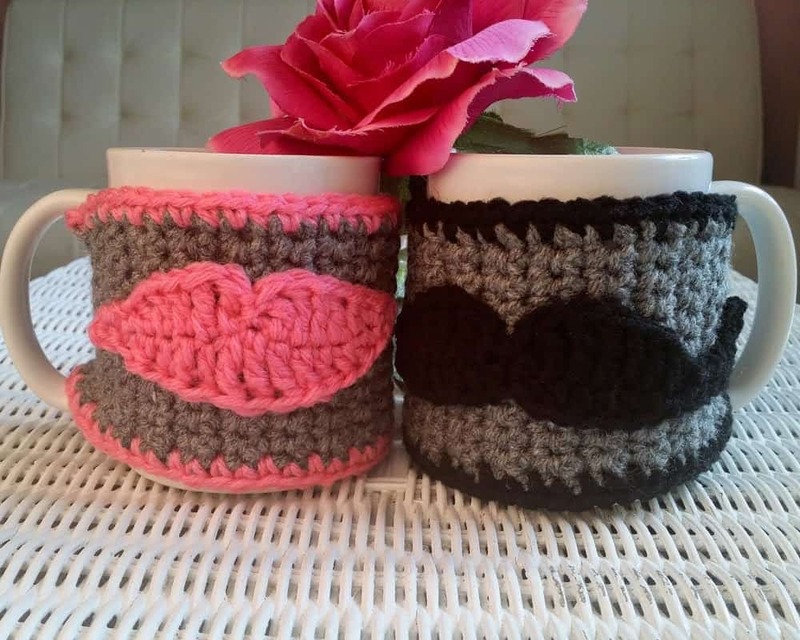 We love that, instead of actually saying “his” and “hers” like so many kitschy couples’ gifts do, the pattern shows you how to double crochet lips and a mustache on top of the base warmer! 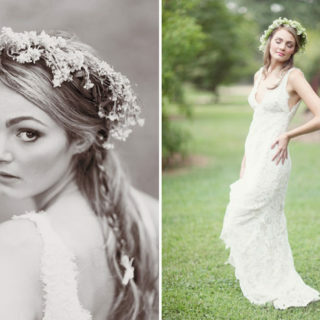 Do you know a young bride who’s doing things her own way and planning a wedding with lots of Bohemian chic in spired style and a sort of whimsical aesthetic to it? Then this “hippie” shawl featuring a beautiful little peace sign in the centre is the perfect way to help her keep a late summer or early fall breeze off her shoulders during the reception party! 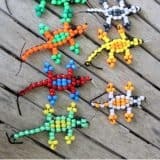 Get the full pattern on Spider Mambo. Did we really catch your attention with the “His and Hers” warmer set we talked about earlier and now you think you’d love to do a couples’ gift, but you actually prefer the gift you’ve seen that say “Mr and Mrs” a little bit more? 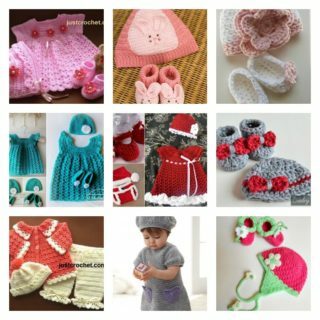 Well, luckily for all of us, there are crochet patterns that will help you make that kind of gift too! Emily Anne shows you how to make cute, simple throw pillow covers that feature the titles right across the front. 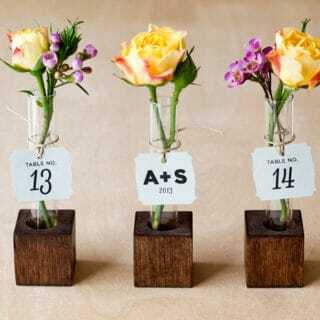 They’re the perfect thing for a couple of newlyweds to put on display! 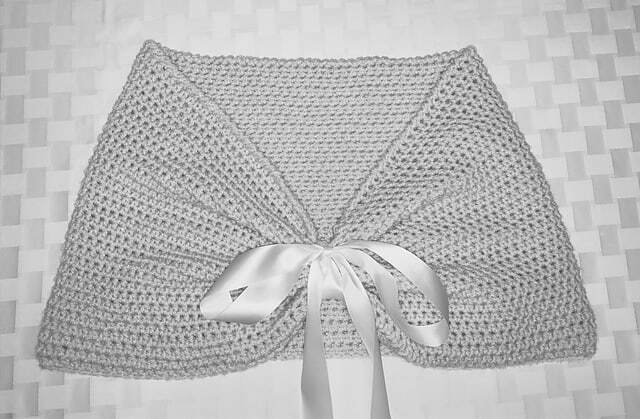 When you think of making someone a crocheted gift for an occasion as important as their wedding, does your mind immediately wander to larger pieces that are more of a time investment but also more likely to be used, kept, and cherished by the person you make them for? In that case, you might prefer making an afghan instead! 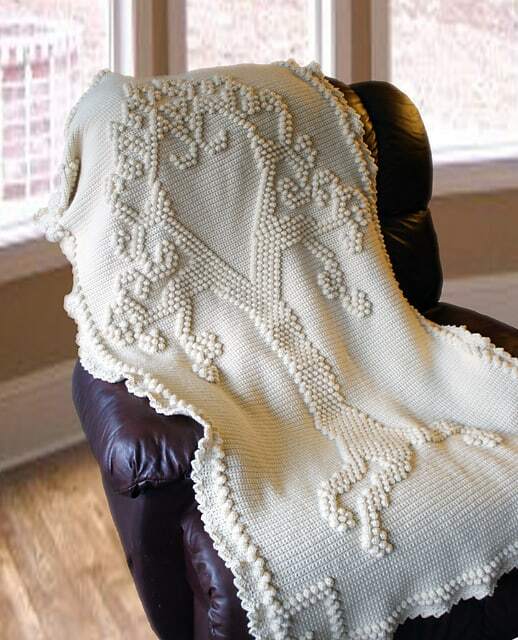 This absolutely stunning tree blanket, found on Deja Joy, might be the project for you. It’s something that has the potential to become a family heirloom! 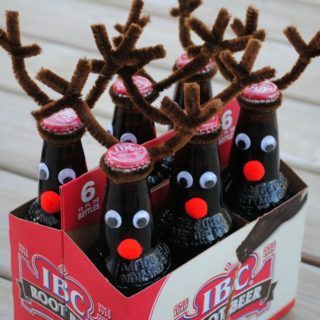 Are you making gifts for some silly, fun friends of yours who have a sense of humour and love trinkets and funny décor? 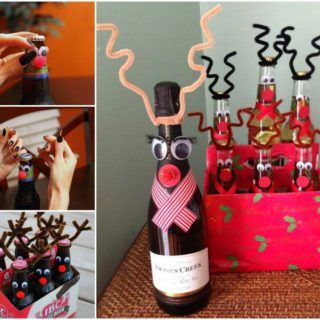 Then maybe you can offer to help them out by hand making them some photo booth props or fun centre piece things! 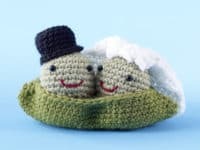 We love these adorable little amigurumi crocheted bride and groom props from Melissa Smiedts because they look cute but they’ll also give guests something to play with between the meal. 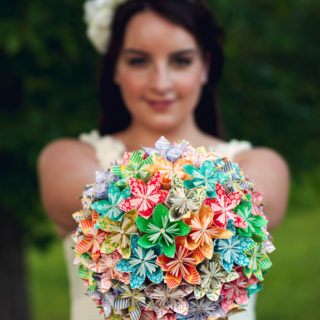 Alternatively, the bride and groom could use them as cake toppers and hang onto them as keepsakes after! 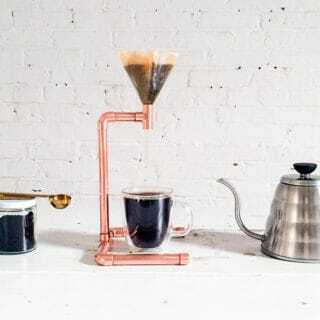 Are the friends you’re making things for the kind of practical people who would prefer a gift that they can actually make daily use of instead of something whimsical or decorative? 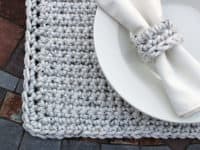 We’re sure they’ll appreciate whatever you make them either way, but being good at crochet actually gives you many awesomely easy ways to give your friends very useful gifts indeed! 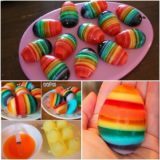 Martha McKeon suggests making them a set of differently coloured dish clothes. Any yarn crafter will tell you that well made cloths like this last almost forever! Have you been out on enough girl’s nights with your friend to know that she’ll choose the fanciest shoes with the highest heels for her wedding day, but that she’ll also want to kick them off the second her feet start to hurt so she can enjoy dancing at the reception after? In that case, your crochet skills can totally save the day without ruining her look! 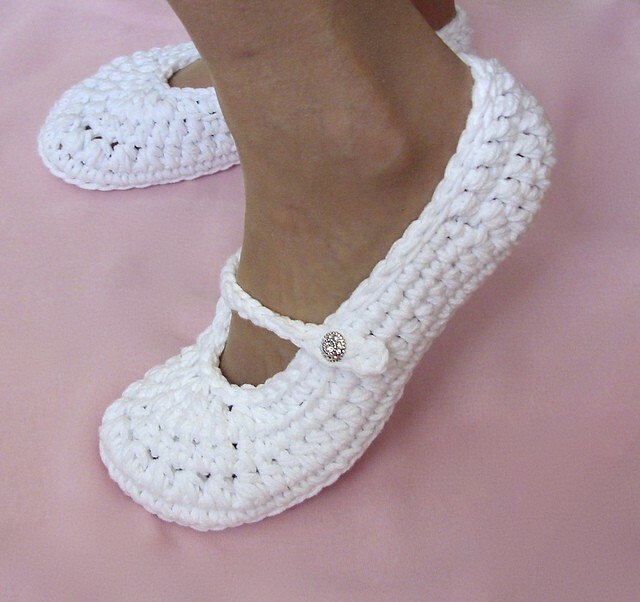 We’ve made more than one bride in our lives these adorable little crocheted slippers from Lisa Corinne Crochet. They’re comfortable, super cute, and they fit in a clutch so they can be swapped out any time at all. Perhaps the bride has been looking for something to keep her warm when she’s traveling between the church and the reception venue on the big day, but she wants something that will suit her dress and complement the look rather than something that will cover the gorgeous piece that she only gets to wear for one day? 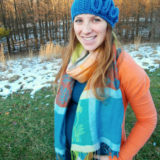 Then help her out by crocheting a stunning, toasty warm shoulder wrap just like this one from Debra Christensen! We simply adore the idea of attaching ribbons to be tied at the neck to fasten the shawl. 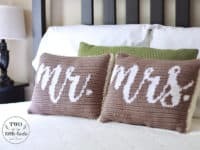 Are you still intent on making your newlyweds something they’ll really make use of but you made them dish cloths for their wedding shower, so you know they certainly don’t need any more of those? 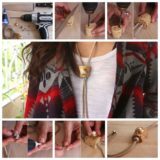 Don’t worry, there are plenty of other little useful household things you can make them! 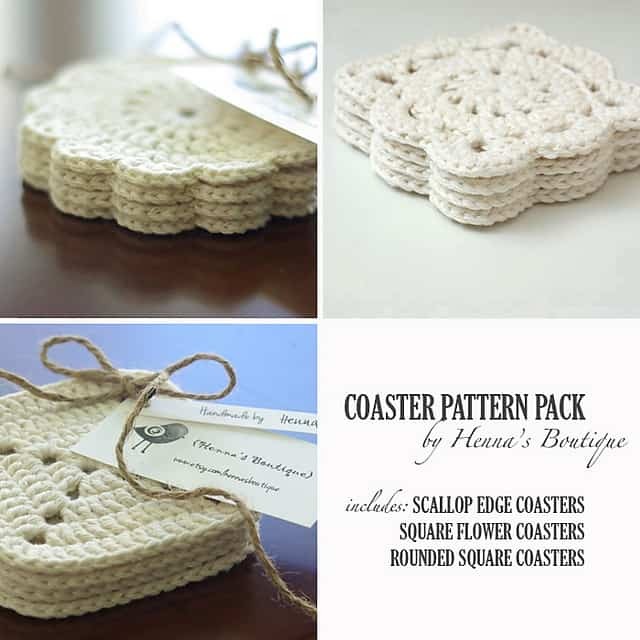 We’re pretty big fans of the crocheted coasters we own, so we always suggest those as a great wedding gift option. 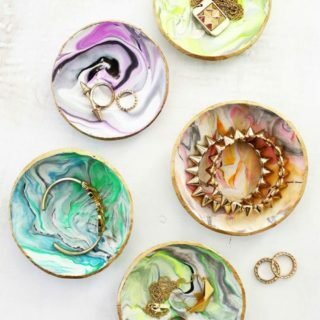 They’re simple to do but they’ll certainly be appreciated, and they’ll look great each and every time they’re used! Find this adorable pattern on Henna Huckzkowski. 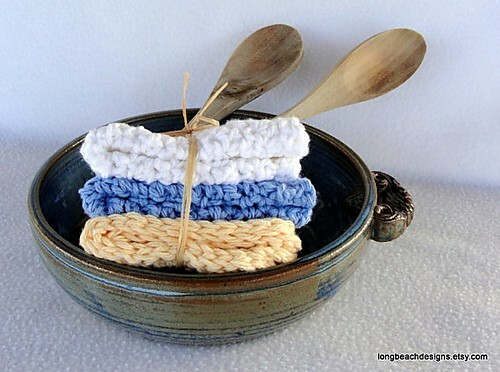 Just to make sure that you have a full range of versatile, useful options before you grab your yarn and your hook, here’s another great household idea from Carla Malcomb! We love the idea of a matching placemat and napkin ring set because it really pulls the table together and completes the look of the whole dinner scene each and every time you use them. If you’re going to start making your newlyweds kitchen theme things, you might as well go out and make them some dish towels to go with the dish cloths too! Because dish towels are a little bit bigger, we really like the idea of making a simple pattern, like these cute chevrons. 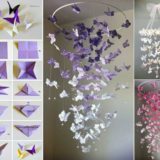 No matter what colours you decide to do them in, Jennifer Pionk has the pattern for you. 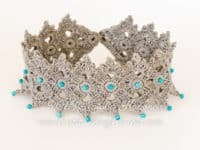 Are your absolute favourite things to crochet actually delicate pieces of jewelry that you’re pretty sure no one else attending the wedding is going to be making something similar to? In that case, you’ve got the perfect present on your hands! It’s always nice to give someone a gift that’s genuinely unique, especially on such a special occasion, and handmade things are about as unique as you can get. We love the idea of giving a new bride a stunningly delicate choker, just like this one by Natalia Kononova. We’d keep the lovely turquoise beads, but you could easily replace them with another colour or kind and it would look just as pretty! Perhaps the wedding you’re attending is that of a fellow crafting enthusiast and they’ve actually chosen certain pieces of their wedding to be intentionally DIY so everyone can see their personal style and passions up close? That’s an amazing idea but it’s also probably a lot of work, so why not off your services and make them a beautiful crochet bouquet? 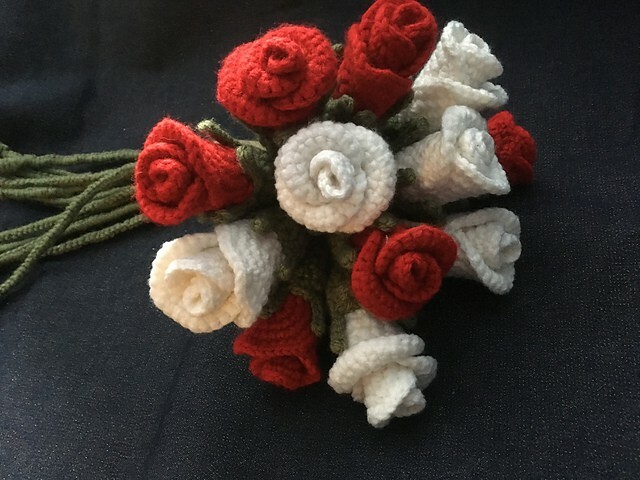 We’re positively in love with these stunning little red and white roses from Rebekah Dube, but we also like the idea of making them in all different colours or whatever shades suit the overall colour scheme of the wedding. 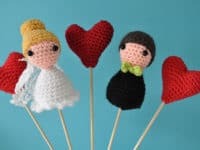 Were you pretty intrigued by the idea of crocheting something silly, kitschy, and amigurumi for your newlywed friends but you know they’d appreciate something even more random and “punny” then the bride and groom dolls we showed you earlier? 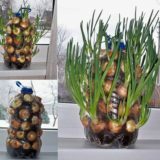 Then we think we might have found the perfect adorable project for you! 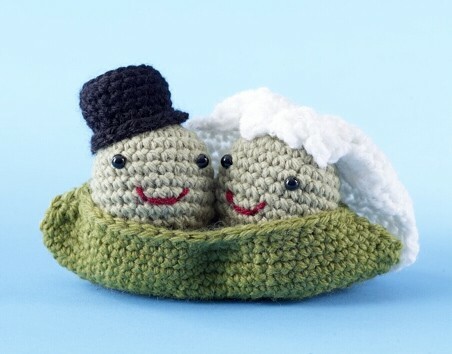 We can’t get over how amusing these little “peas in a pod” are already, but they’re even cuter because they’re dressed for a wedding of their own. Find out how they’re made on Lion Brand. Did you love the idea of knitting jewelry for a wedding but you know the bride already has a necklace picked out, so she won’t need a pretty choker like the one we showed you? 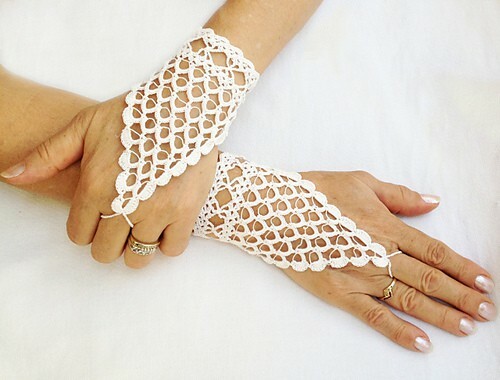 Well, these fingerless lace “gloves” aren’t technically jewelry, but they’re prettier and daintier looking than just about any other wedding accessory we’ve ever seen. 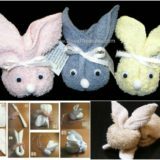 In fact, we love them so much that we just might make a pair for all our upcoming brides and ourselves, stashing them away for our own wedding in the future! 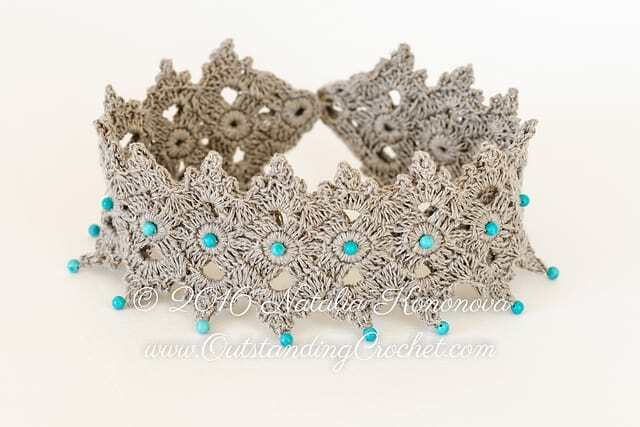 Take a closer look at each lovely, delicate stitch on Nez Jewelry.